'Tis the season for wedding planning! It’s important to plan ahead with ordering your wedding cake. Making an appointment quickly is key to do months in advance. It's never too early! A very popular design is having piping that matches the embroidery or lace on your gown. 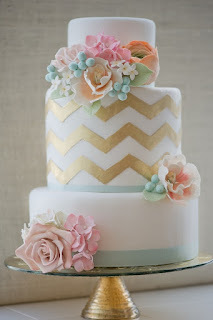 Dividing up the layers with different designs and a colored ribbon is also a unique twist of tradition. Don't be afraid of fondant! It helps create a clean finish for looks like chevron and ruffles. However, with the right amount of skill, a ruffle cake can be created using buttercream. One thing that makes planning baby showers so fun is by far the theme. If you know the gender of the baby, you can flood the room in shades of pink or carolina blue. If the gender is unknown, a safari theme is great. We threw a baby shower for our friend's first baby boy, and had a monkey cake! But ultimately, it all depends on the mom-to-be. Plan a party around her personal style and you will surely have a blast! These adorable baby safari animals are made out of royal icing. You can order something similar on Amazon.com . In order to frost a cake properly, you must have a turntable! It allows you to frost all ends evenly and with ease. It's also helpful when decorating your cake with pearl borders or polka dots. Either you need one, or you know someone who loves to decorate cakes and needs this perfect gift! If you are in Buffalo this weekend, be sure to check out the Allentown Art Festival! Bob Gregg Art and Joe Cascio Photography! We're loving Bob Gregg's newest dessert table painting! The minute we tried these delicious bars, we knew we had our new favorite cookie. This is a great and simple recipe to impress your friends at the next get together. You will watch how quickly they are devoured and it will give you joy. This recipe is super kid-friendly and you will find yourself finding reasons to make a batch! Happy Baking! Find the recipe after the jump!